Day two of the Rolling Resistance, Preston New Road, Lancashire. 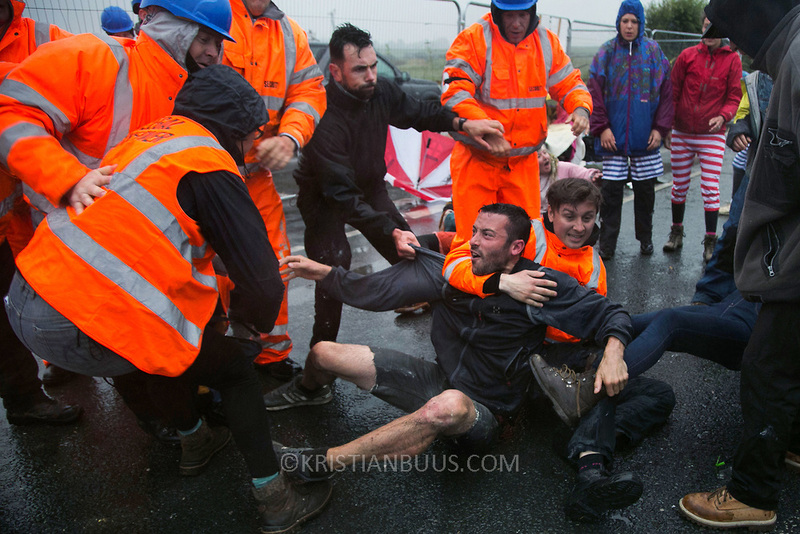 Security violently try to prevent climate protectors to lock-on at the gates to Quadrilla drill site. One activists was restrained by the site manager using pressure points to the neck and throat and pinned to the ground by security staff on the road outside Quadrilla's property. Two activists managed to lock themselves down and block the gates. A lock-on, where two or more lock themselves together inside a re-inforced tube is used as a peaceful non-violent way protesting. The New Preston Road Quadrilla site is almost ready to start drilling for shale gas after many delays caused by local objections. Lancashire County council voted against fracking but the conservative central government forced it through.